What's wrong with giving Josh +1 for teamwork? Next Thursday, Paul Driver is taking part in an online discussion at #AusELT chat about gamification that promises to be very interesting. 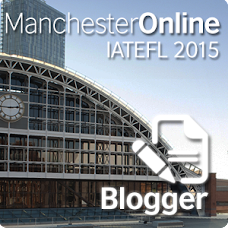 In preparation for this, Paul has written an article, Well done Josh +1 for teamwork: Gamification and Crabs which outlines his stance on this new(-ish) trend that has started to enter the ELT classroom. Paul makes some very valid points about gamification, which is often defined as the application of typical elements of game playing (e.g. point scoring, competition with others, rules of play) to other areas of activity. He doesn't sit on the fence when it comes to saying what he thinks of it, implying that gamification is "at best, an over-hyped and misguided fad, and, at worst, an evil and manipulative strategy for getting people to do things they normally wouldn’t want to." It's not the first time that Paul has spoken against the trend. In 2012, he wrote on his blog, Digital Debris that "in the majority of its current implementations, it is not game-like enough" and "by overlooking the depth and breadth of the potential games have to empower and motivate learners and create meaningful experiences...gamification is doing a disservice to both learners and educators." A lot of what is written in both articles rings true, and should be taken as warning shots for any educator who thinks they turning their classroom into a game is an easy undertaking that will work wonders. As Paul implies, there's a lot more to game-based learning than first meets the eye. As a practitioner who is interested in exploring this area with young learners and teenagers, I have encountered the difficulties first-hand at the (digital) chalk-face, first when using Chore Wars in 2011 to gamify a class preparing for the FCE exam, and then in 2012 gamifying speed-writing with a group of young teens. The former worked only partially (yes for the younger teens in the class: not at all for the older teens) and the second required a number of adjustments over the course of the term when I used it in order to keep it working. I'm currently finishing off a chapter for a forthcoming book that details this action research. So, where do I stand? Somewhere in the middle ground, I think. I'm attracted to the idea and my own experience tells me there is definitely something in it that is worth exploring, but it requires caution as it could have the opposite effect to what is intended if badly implemented. In his latest article, Paul mentions Class Dojo as a high profile example of gamification being used in the classroom. Although he doesn't say so in the article, I suspect Paul does not think highly of this behaviour management system. If this is the case, I think he hasn't spent enough time teaching primary or secondary kids. I was introduced to it at a conference and know immediately that I was going to start using it in class at my first opportunity, and I blogged about it enthusiastically. Say what you like about it, but it works very well. When I introduced Class Dojo to the language academy where I worked, it swept through the place like wildfire and is still being used today. In some ways, it's just taken the place of the star chart on the wall, which is actually proof that prior to the introduction of gamification as a term, this sort of stuff was happening in classrooms all around the world. In conclusion, I doubt whether there are many YL teachers out there who don't use some sort of star chart or other behaviour management system in the classroom. And whilst Ian Bogost and Jane McGonigle are certainly leading experts on game design, I suspect they know little about the practical realities of teaching a group of 20 eleven-year-olds. I also suspect there anti-gamification stance is more targeting the tidal wave of simplified pointsification that commercial enterprises have started to embrace than the digitalisation of something that has been going on long before videogames were ever invented. What do you think? Although the time isn't ideal for me, I'm hoping I can make it to the #AusELT chat next week - hope to meet some of you there. Come along and join in the debate. Before I started working at Plan Ceibal, when anyone mentioned video-conferencing, I'd think of Skype. There was that other way of doing it, but I assumed that was for corporate meetings in big businesses. I did wonder before I started working here why they were installing expensive video conference systems and high speed fibre-optic cables in schools all over Uruguay and insisting on it being installed in Argentina, Mexico, Colombia and the Philippines (where the remote teachers are based). Why didn't they just use Skype or another similar system? I asked myself. 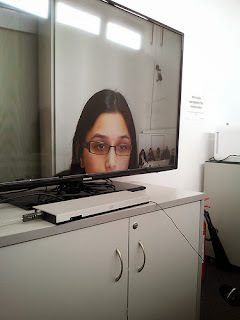 Now, after helping with installation and testing of equipment, observing classes and working here for over three months, it is clear that part of the success of this project is because high definition video-conference equipment is used and not the low quality, low-cost solutions that are fine for most people's domestic use (and sometimes business) use. Having to depend on Skype myself to contact friends and family and to talk to colleagues from Montevideo has also underlined this too. First of all, for the project to work, it requires the use of equipment that is durable and reliable and an internet connection that is fast and reliable too. That's not to say there are no technical problems - there are, but these are far fewer than there would be if a lower quality less reliable system was used. Then there's the quality of the image. When I first walked into a classroom with a remote teacher (RT) on the screen, it was almost like she was in the room too. The sharpness of the image means makes it more real for the kids. It also means the RT can see details and even identify the children, which would be impossible using Skype. The lesson plans also require desktop sharing of images, audio and video, which would be problematic, but which works like a dream with the VC system. It's not just the fibre-optic lines either. For a period of time, while waiting for delivery of VC equipment in the Philippines, the organisation there used a temporary solution (MOVI) and although they were able to cope, there were more technical problems that needed to be dealt with. When the VC equipment was finally set up, the teachers and kids almost jumped for joy at the visible difference in quality. 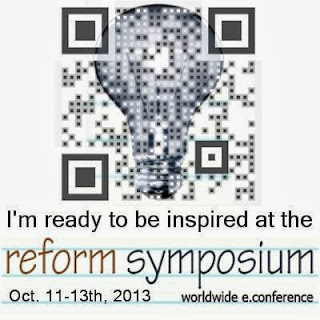 I was happy to be invited to present at the Future of Education´s Reform Symposium 04 (#RSCON4) and have decided it was a good opportunity to talk about the kind of teaching that is happening via video conferencing on the Ceibal English project. 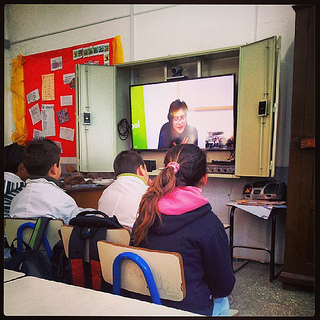 In Uruguay, due to a lack of qualified and experienced teachers, English is being taught in almost 1000 primary classes across the country via video conferencing, using teachers from elsewhere (other parts of Uruguay, Argentina, the Philippines, Colombia and Mexico). Because there are two teachers, the classroom teacher (CT) and the remote teacher (RT), a new type of methodology is being developed that combines elements of distance learning, team teaching and blended learning, but which is also requires a unique approach. This online conference promises to be very special - there are lots of very interesting sessions already lined up to choose from. See you there? In the Ceibal English project, the students are physically present in a classroom. Additionally, although the RT is separated by distance from the students, they are with their regular teacher (the classroom teacher, or CT), whose role is crucial if successful learning to take place (this is not a transmission teaching model unlike the plasma teaching that took place in Ethiopia - but I'll save that for another blog post at another time). 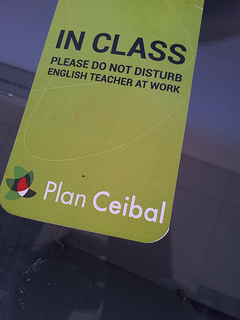 What is clear is that the Ceibal English system is all about team teaching, with the RT being the qualified and experienced English language teacher and the CT being the teacher who best knows the learners and who is responsible for classroom management and the language practice activities during the week. To be honest, the term remote teacher is not ideal either. If you search for remote teaching in Google, then you'll find examples of regular teaching being done in remote communities, such as this one from Western Australia. However, the kind of teaching being done in the Ceibal English project is distinct from the teaching being done by what most educators assume to be distance education, so it is worth using a different term to distinguish it. I've now been working in Montevideo for Plan Ceibal for just over three months now and still can't get over the fact that it feels like I'm in a very special place at a very special time. Three months isn't a very long time, but it feels like I have learnt a lot since I've been here. As the British Council's project manager for Ceibal English (Ceibal en Inglés) in Uruguay, I took over from Dario Luis Banegas, whose article 'ELT through videoconferencing in primary schools in Uruguay: first steps' is an excellent introduction to the pilot and first stage of the project. The introductory project video (below) gives another good overview of what is involved. Shortly after I arrived, the project expanded from 500 English classes a week to just under 1000, with classes being taught in multiple locations across the country by remote teachers from various institutes in Montevideo, the British Council in Colombia and Mexico, AACI and other institutes in Argentina, and SME in the Philippines. I'm happy to say this expansion phase was successful thanks to the efforts of many dedicated professionals and it definitely feels exciting to be part of what is a unique countrywide complex project involving the teaching of English and a combination of learning technologies. Since the expansion phase in July, I've been able to observe teachers at work and my idea is to now blog about different aspects of the project here. It is a complex and dynamic project that is changing as it is being rolled out. There are parts of the project that tend to indicate a new teaching methodology is required, and Jeremy Harmer reflected on this in a recent blog post after visiting a school and observing a class. This post and the comments posted by a variety of people both involved and not involved in the project make very interesting reading. It's partly due to the comments posted there that I've decided to reflect on different aspects of the project here.